Create Word report direct from a Mechanical model. The Word template can be modified by the user. Customer tailored versions can be made to include additional Mechanical features, section headings and text objects etc. ANSYS Mechanical pre-processing tool to create a non-linear stiffness boundary condition with friction on the structure. 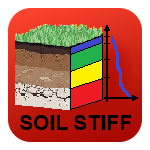 Layered soil stiffness data from csv text file can be applied and resulting pressure and friction can be plotted.